THE Himalayas are warming at a rate higher than the global average. A recent study documents how this has affected cropping patterns and vegetation in the past 10 years. The questionnaire-based study examined changes people observed between the altitudes of 600 metres and 2,200 metres in the Himalayas. Publis­hed in the journal Current Science on March 25, it shows the flowering and fruiting time of economically important trees has changed. Yields of cash crops like potato, ginger, peas and beans are no longer what they used to be a decade ago. The pear tree, which bore fruits in July, now also give fruits in December and January. The study found kaphal fruits (Myrica sapinda, Myrica nagi) started ripening in March-April, instead of May-June. Hinsalu (Rubus ellipticus) now fruits less. 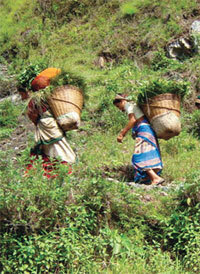 Fodder trees like utees (Alnus nepalensis), kwiral (Bauhinia variegata) and kanol (Bauhinia purpurea) show decline in productivity. About 10 years ago, the invasive weed Eupatorium showed up at an altitude of 1,000 metres. After a years it was seen higher at 1,800 metres. Researchers found climate change severely affects the day-to-day lives of people directly dependent on agriculture and horticulture. The study can add to bigger studies done world over on the impact of climate change. Though anecdotal information is available, enough studies have not been conducted to understand the impact of climate change. “Local observations could be used to devise mitigation and adaptation strategies on regional scales,” says P K Joshi, lead author of the study and associate professor at Teri University. The editorial is very apt. The editorial is very apt. But i do not agree completely with the fact that the interviewing community will anyway make us blindly accept climate change. Given the global scale of the issue, there are multiple ramifications to it. I think the key to climate change mitigation or adaptation definitely begin its journey somewhere with the local community. It is the profound local, region specific community behavior understanding and documentation, that will allow us track the changes precisely felt by the community. After all the adaptation or mitigation action plans are essentially undertaken by and large for the community and if they are blindly made to implement without considering their perspectives and opinions, then it will just end up being a highly budgeted and over hyped fiasco...a just another Copenhagen BUZZ, where the focus is on the end result and not the process to reach the destination. If we need to understand the impacts of desertification on the communities residing in the desert regions it is imperative to understand and document the climate change impacts felt and observed by the community, dovetail it with our scientific observations and then think of proceeding towards any mitigation/adaptation action plan. The stronger is the mitigation, the lesser will be the adaptation required, but then, for the same a deeper understanding of issues at the grass roots level is required. The Civil Society and the NGO's need to forge this in their policy and decision making process. I agree that observation of local people will provide valuable information. In fact, ignoring their observations has already delayed policy interventions at the right time. In my opinion the time for mitigation efforts has already passed. Moreover, it is a global issue that needs concerted global action.